On October 26, I headed to Denver for a Girls Weekend with Janel, Sara and Tanya. We had a great time on the drive over discussing movies and books and other things!! A stop off at Colorado Mills Mall saw some serious cash being spent (by me) between three stores - Eddie Bauer, Sketchers and Oakley :-D Nothing to huge, just a few small things to find room for in the suitcase!! The next day, Tanya had bought her season tickets and we all were able to go to see the Broncos play live at Sports Authority Stadium against the Redskins!! This was so cool - the crowd was massive and everyone was in orange, which made the stadium look amazing! When the other team is on the offensive, the whole stadium makes so much noise to try and distract them, it literally vibrates in your chest! And the tailgating beforehand was phenomenal to see......... all around it was a great day! when a Bronco touchdown is scored! As most people know, Halloween is a huge holiday here in the States. Houses were decorated, shops were full of themed items and food, haunted houses and corn mazes abounded......... and it was the last two that I experienced for the very first time this year! My first rite of passage into enjoying Halloween was to experience a haunted house. There were quite a few set up throughout Grand Junction and they were run by groups and non profit organisations for fundraising events. Sara took Katie and I to one on North Avenue with Richard, Mark and some of their friends. It was a definite experience - they used lights, props, people, noises, even a chainsaw to scare you! Katie and I spent the entire time with our elbows locked and our shoulders around our ears, but we made it through - and even gave Sara a good laugh as she watched us trying to squeeze through a small doorway at the same time!! 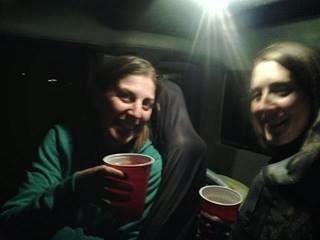 Katie and I shoring up our courage before leaving the truck! 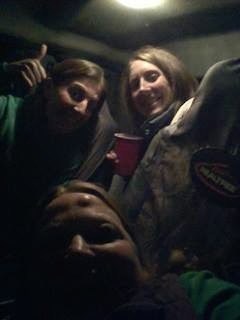 A few weeks later, the three of us headed to a haunted corn maze (at 11pm!). Basically, they grow the corn around the path (or cut out the path - I'm not sure which way) and then build in little huts you walk through with different themes, lights, props, people scaring you........ again, Katie and I were linked at the elbows and I was hanging onto Sara's thumb as we walked through the dark. Both were terrifying but what kept me alright was the knowledge that the students who were the scarers were not allowed to touch us!! :-) The first and only time I will ever experience such haunted places!! November to come........ Keep smiling!